Cyber-attacks are estimated to cost the United States’ economy billions of dollars every year. That is primarily because hackers are becoming more sophisticated in the ways they obtain information. Despite these alarming updates, most business owners have not adequately prepared for cyber-attacks. As National Cybersecurity Awareness Month winds down, The Insurance Center would like to share a few simple tips that can help businesses protect the families, consumers, and employees they work with regularly. Sammon says that while cyber liability insurance can help businesses stay afloat, sharing prevention tips can help save families from the financial ordeal of identity theft. Here are some ways to shield personal information from unscrupulous individuals. Employers and employers should ensure passwords used for various accounts are unique and nearly impossible to guess. Phishing messages can appear to come from co-workers or people you know. Employees can help protect businesses if they are told to pay close attention to details such as checking for correct spelling of emails or text within messages. Employers can protect important data by creating a system for employees to share when they receive a convincing phishing message. This will help other employees from compromising valuable information. If employees are skeptical of a coworker’s messages, employees can avoid falling victim to a phishing scam by verbally confirming the authenticity of the message with the sender. Information such as social security numbers should only be seen by a handful of people with a track record of trustworthiness. SSN numbers combined with a correct name and a birthday can be used to steal someone’s identity and place them in financial hardship for many years. Telling consumers about a cyber breach and dealing with the legal implications can take significant resources away from any business. 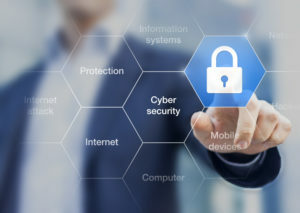 Cyber insurance can help businesses with the cost of legal fees, alerting consumers of a breach, and may even help affected individuals restore their identity. The Insurance Center works with several insurance providers to ensure policyholders are paying the best value for comprehensive coverage. Call us at 603.542.2551 to learn how we can help you protect what matters most.